Here it is — our 100th More Front Wing podcast! We’re so excited to have reached this milestone and even more excited to spend it sharing the stories of the best and most favorite IndyCar memories from every corner of the IndyCar Nation. You’ll hear from folks hailing from Speedway, Indiana to the United Kingdom, Australia, and everywhere in between as they share their stories of the moments that hooked them on IndyCar. Some people recall their first live Indianapolis 500 experience, others had memorable experiences with drivers, and a number of folks mentioned great times with other IndyCar fans. We’re also extremely grateful to have heard from a number of the members of the media who have kindly offered their time and expertise to the podcast over the years, including ESPN.com contributor John Oreovicz, Crash Gladys of Speedfreaks, the dynamic duo from NBC Sports Network Motorsports Talk Tony DiZinno and Chris Estrada, TrackSide Online’s Patrick Stephan, and many others! A few people submitted photos for us to share as well, which are at the bottom of this post. And the entries keep coming, so we’re going to add them to the comments section below as we get them. If you’d like, please feel free to add yours. Putting this together was a very personal and humbling experience for all of us. We’re extremely grateful to all of you who participated and continue to listen to our podcasts and support us, and for the opportunity we have to go into our fifth season of IndyCar racing still going strong. Thanks to all — and enjoy! Patrick Smith enjoys drawing IndyCars on his computer and having them signed by their drivers. 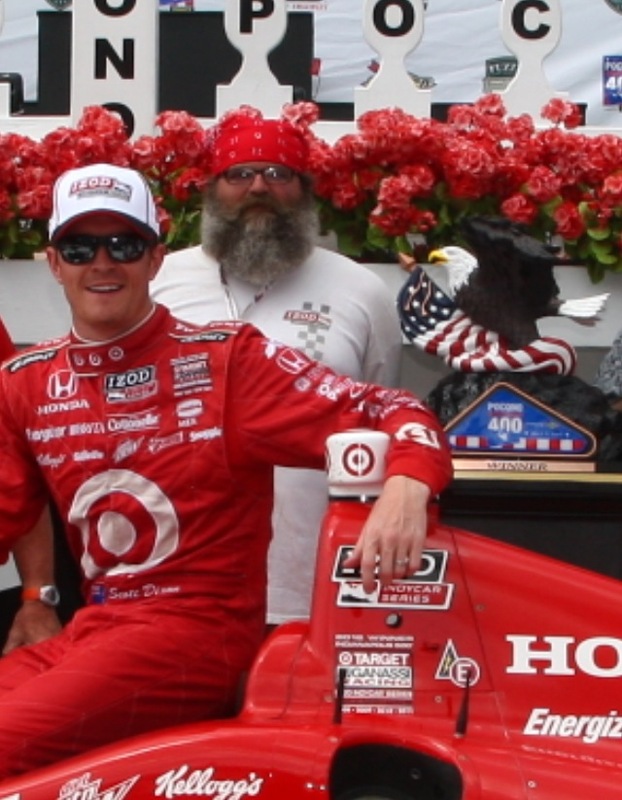 Troy Lantz got to have a two-seater ride and a victory circle photo at Pocono this year! Amy Woedl (also known as Open Wheel Mom) says Pippa Mann welcomed her son Gage into her garage at IMS this year and went above and beyond to amaze a young fan. 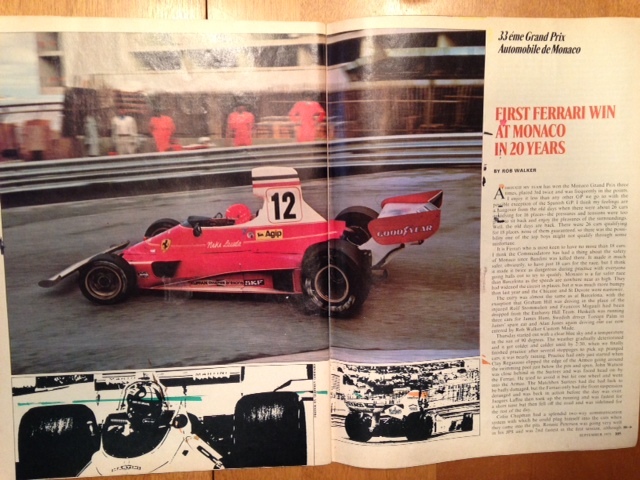 John Oreovicz submitted this photo of the September 1975 issue of Road & Track showing the Ferrari picture that sparked his fascination in auto racing. “You can see the marks from the edges of tracing paper from when I drew this car,” he adds. Here are some more memories that were submitted to us after we recorded the episode. 1988 was the first time I “got it” at Indy. I was 15 years old, so the most memorable is the day I became obsessed with the Indy 500 and its history. On that day, a scrappy Scotsman named Jim Crawford ran up front to the surprise of nearly everyone, dipping tires in the grass, dicing hard in traffic and taking the lead at one point — he ran with the Penskes despite not being able to walk well and still being in a ton of pain. Perfect weather, great race, beautiful cars — it was my favorite. My favorite IndyCar memory was made in 1995 at Michigan International Speedway. Scott Pruett battled Al Unser, Jr. down to the wire for the victory in the Marlboro 500 and won in a thrilling side-by-side finish! It still ranks as one of the most exciting races I have ever seen all these years later. In 2011 for the 500 I won two passes to Chip Ganassi’s suite through Scott Dixon on Twitter. As you know, that was one of the hottest Indy 500s on record. My brother and I never dripped a drop of sweat as we sat in air-conditioned luxury munching on chicken wings and wraps throughout the race. It wasn’t until the final 20 laps that we went on top of the suites to take in one of the most amazing finishes ever. For the longest time we thought JR Hildebrand had pulled out the win as his battered machine continued down the front straight and slammed into the T1 wall. We couldn’t figure out why the William Rast pit guys were going bonkers … then the announcement was made that Dan Wheldon had scored the victory. As individual races go, that’s one of my favorites. My favorite thing about the series is the access I’ve had, as just a fan, to get close to the action. My dream of being a freelance photographer is still alive… but even without a vest, I can capture some good images to share with my friends. My second (and fate-sealing) interaction with the Speedway was to see the race in person in 1979. I anticipated that day much like most any Christian kid did with the coming of Christmas morning. The wait for that day was nearly interminable, but the day arrives and our journey begins. Sparing the day’s travel details, we found our seats in the first row of L-South stand bleachers. L-South (gone years ago to the expansion of the mighty aluminum L-Stand) was deemed a great raceday value by my father and I’d have to say that he was right but not exactly for the reasons he surmised. His reasoning was that we were seeing the cars at top speed but paying less than half of the price for the seats corresponding to our location which was the outside of Turn 1. My reasons became immediately apparent on the first green flag lap. We were a scant 18 feet away from the outside wall of the track at the point where the cars have reached top speed on the backstretch and are beginning the entrance to Turn 3. He was right about the speed. I’m fairly sure that he had no idea the extent of sensory-loading that would occur by being that close to the track. 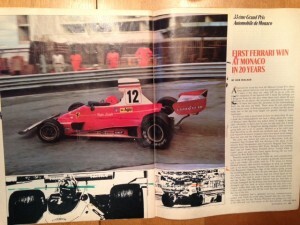 My friend and I were 11 years old and, by all parental reports, were the quietest they’d ever seen us during those opening laps of the 1979 race. Anticipation had finally given way when Tom Carnegie came over the PA system announcing the green flag had fallen. Cheers went up in L-South and all around, followed by a quickly hushed anticipation of the coming cars. 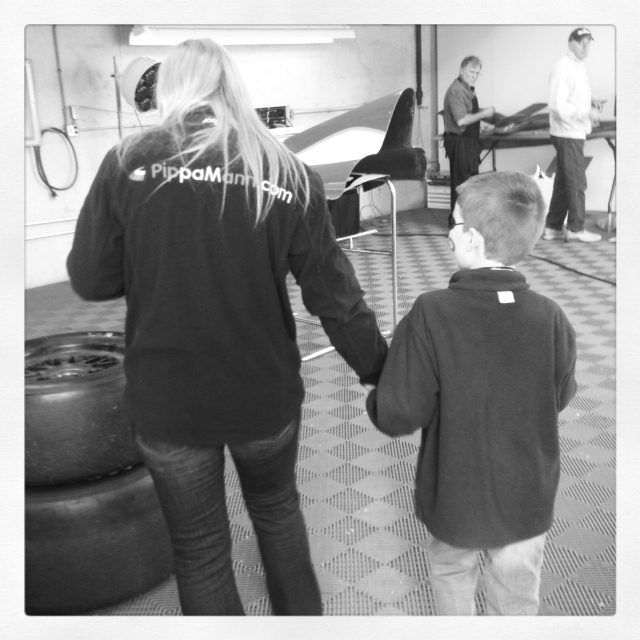 I very distinctly recall the following moments and think about them most fondly on raceday each year. I’m not sure I will ever understand fully the extent of the impact those moments had on me, but the result was clear – I had become an Indy 500 fanatic. The crowd sound swelled from the large L-stand whose view directly down the backstretch signaled the coming onslaught of machines. I recall the bleachers vibrating slightly followed immediately by the crescendo of screaming Cosworth, AMC, Offenhauser, and Drake-Goossen-Spark, motors and an overwhelming wave of sensory loading culimnating in the decrescendo of motor noise and the sweet, pungent smell of burnt ethanol. In approximately 9 seconds, I had felt, heard, seen, and smelled the most powerful things ever before in my life. I could hardly wait the remaining 36 seconds for the leaders to come back around and experience it again. That brief moment and the following events were so powerful, I would long for that day to arrive every year. In the years I couldn’t attend, I listened even more intently than ever before recalling that beautiful, sunny, Indiana day when the 33 (plus 2 due to the USAC-CART legal wranglings that year) cars shook my senses to the extreme. To this day, I still cannot imagine a sporting event having more impact on me than May 27, 1979. I forgot to add, the complaints we had in 2000 are just as true today: more ovals please! In Europe we have a ton of open wheel road courses (okay, mostly F1 feeder series, but still..). Open wheelers on ovals just look fantastic. I also can’t believe I forgot to mention that I got to see Alex Zanardi race at the Paralympics and was 20 feet from him when he collected his medal. A very special memory. Although I went to my first Indianapolis 500 in 1965 at the age of six, I’m not sure I “got it” until I went to qualifying for the 1967 race. I did not go in 1966, as my father took my uncle and grandfather instead. So, I had two years to think about it. When I returned for qualifying in 1967, I saw Silent Sam, Dan Gurney land on the pole just before Mario bumped him to the middle of the first row. Two weeks later I was back for the race, which saw Parnelli dominate with the turbine before giving way to my all-time favorite AJ Foyt. Thus bean my life-long love affair with the Speedway, the Indianapolis 500 and IndyCar racing. Incredible show, guys. I loved every second of it. Can’t wait to hear the next 100 podcasts, and to see all the things that transpire during that period of time.